Enjoy soothing warmth, a variety of infusions and a crackling log fire in our sauna world. We offer you a range of cooling-down options to refresh you after each sauna visit, such as a plunge pool (15°C), a variety of showers and a thermal water pool in the outdoor area with a temperature of 26.5°C. Comfortable loungers in the sauna garden and on the terrace offer you a wonderfully sunny resting place with a view of your natural surroundings. You can also find relaxation in our cosy resting or reading room. The tasty snacks and healthy refreshing drinks offered at our sauna bar complement your sauna experience in Warmbad perfectly. Our rustic mineshaft sauna invites you with flickering log fire and fragrant wood. The mineshaft sauna is an earth sauna with a temperature of 85°C - the most original form of a Finnish sauna. It is set within the earth and thus ensures a pleasant warmth. Relax in the herbal fragrances and the soothing effects of alternating spectral colours in our 65°C aroma sauna. Info: Regular visits to the bio sauna have a regulating effect on blood pressure. 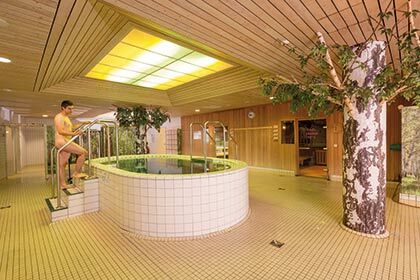 Sweat in our typical Finn sauna at 95°C and get fired up by an hourly infusion. The high loss of fluid as a result of the dry & hot climate in the Finn sauna supports the body’s purification. Additionally, the circulation is stimulated and the immune system is strengthened. The cabin sauna awaits you with a dry heat of 95°C and panoramic views across the sauna garden. Hourly infusions ensure your visit becomes a sweat experience. Sauna connoisseurs will appreciate the ultimate heat sensation provided by the large infusion. Achieve complete relaxation of body & mind in our mill sauna. Enjoy regular steam boosts and aromatic fragrances at 55°C and 55% humidity. In the Roman steam bath you are enveloped by silky-soft aromatic steam at 45°C and 100% humidity. Your Mediterranean sauna experience is rounded off by colour and light reflexes which penetrate the fog. Our tip: Honey, salt or rasul treatments in the Turkish bath encourage circulation. Info: The rasul bath is body exfoliation with beneficial muds. It promotes cell metabolism (elimination of accumulated toxins and intensification of oxygen supply). Do not go to the sauna on a full or empty stomach. To enjoy an uninterrupted sauna visit, you should first of all visit the toilet. Then take a shower and clean your body thoroughly. Dry yourself well, because dry skin sweats faster. A warm footbath before the sauna also promotes sweating. In the sauna you place your towel underneath your entire body. The stay should be short, but the effect should be intense. For that reason you should sweat on the middle or upper bench, but no longer than 15 minutes. Trust your instincts. You can feel the heat evenly when you are lying down. You should however sit up for the final two minutes so your circulation can adjust to the upright position and the blood does not suddenly drop down into the legs. Leave the sauna and get some fresh air. Your body needs oxygen now. Hosing yourself down with the Kneipp hose is the gentlest way of cooling off. Before using the plunge pool you must wash off the sweat. If you have high blood pressure you should avoid the plunge pool. The dousing shower also cools the body down well. After cooling down, a warm footbath balances the body temperature. Repeated cold water treatments train your blood vessels and increase your body’s resistance. A subsequent rest is pleasant and additionally promotes recovery. Collagen light therapy is recommended between the sauna visits. A sauna is excellent preparation for a massage. Follow the same procedure for a second sauna visit. More than three sauna visits do not increase the health benefits of the sauna. The sauna world is open daily for you.